Love to Cook? Share Your Skills at an Upcoming Community Dinner! Volunteering to cook one of our community dinners is a fun and fulfilling way for organizations, families, co-workers, or friends to get together and do some good. We need one group or organization each month to purchase ingredients, prepare a dinner and set up a serving line. (Setting tables, serving and dining room clean-up is usually covered by other volunteers unless you request to also cover that part of the meal.) You do not need to be an experienced cook to make a meal. We have a fully equipped kitchen for your group to use or you can do some of the cooking/prep off-site. This opportunity is best suited for a group of 4 to 8, though larger and smaller groups have volunteered in the past. Cooks should plan on cooking enough food to serve 80 people (number includes feeding volunteers). Grace Lutheran Church offers up to $250 in reimbursement to cover the cost of ingredients, however, some groups choose to cover the food costs as well as volunteer to cook. 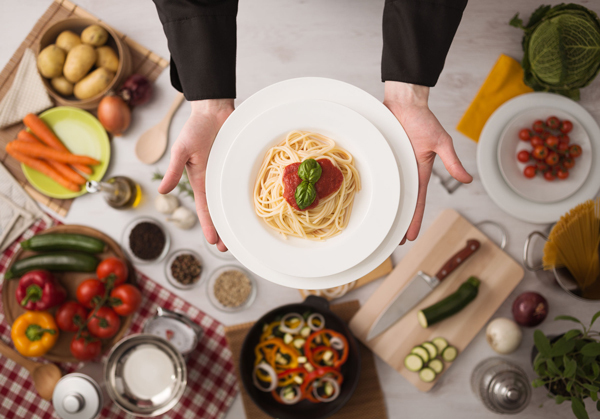 The time spent in preparation for the meal varies depending on the meal you choose to serve. Kitchen space is held in reserve for the cooks starting at 2 PM on Community Dinner days. If you require additional time, let us know in advance. The total time volunteer cooks spend onsite the day of the dinner is usually between 2-4 hours. Dinner is served at 5:30 PM. Your group is encouraged to sit down and enjoy the dinner with the guests. You will meet great people and have interesting conversations! Past meals have included: meatloaf, lasagna, spaghetti, chicken pot pie, tuna salad, tacos, ham and scalloped potatoes or cheesy potatoes, pulled pork, beef and potatoes, turkey and mashed potatoes, baked ziti, chicken and meatballs, goulash, chili, roast beef and baked potatoes, and calico beans. Contact Penny Hinderaker for open dinner dates at 612-788-8751 or phinderaker@comcast.net.